Now, I know some cities purposefully sculpt parkway trees. They think it looks neat or unique, I’m not sure. Glendora comes to mind. 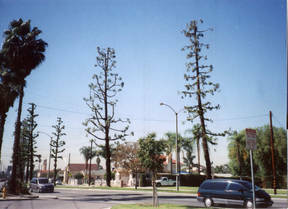 They are fans of the lolipop trees on Glendora Avenue between Foothill and Bennet. Many say they look great when adorned with Christmas lights. There’s also the trees of St. Alban’s in San Marino. But this display in Baldwin Park lacks imagination. Some say the trees are strangling. Or have been barbered to the extreme. 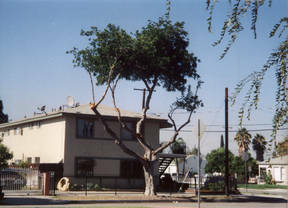 Funny how trees can be so important to residents. One is near the redevelopment zone. There is no redevelopment plan that will add trees, as far as I know. my kitchen and office turned into a video production studio. him, just to put both of them out of their misery. creativity and varying media into homework assignments. blog, instead of on paper. are experts in virtual realities. this is possible is the breakthrough. the Sun Go Down On Me. Needless to say, it was not fine technology. them are more familiar with these tools. the other working his Macbook laptop. His iPhone was next to him. Wires are coming out of his ears. desktop and pulls up the ad appearing on YouTube for the MacBook Air. laptop, also in the home office. Air, down to such detail that he lost me a few hundred megabytes ago. Sixteen-year-olds 3, forty-something media professional, 0.
investment to buy a laptop for college, I said. No, duh! they were probably thinking. opinion writing at Cal State Fullerton came to class with laptops. age group, and on up are uneven on their computer/video expertise. as folks in Pasadena or Los Angeles. Iowa Caucus and beating the Clinton Machine to boot. every Friday night until recently when it closed for the winter. 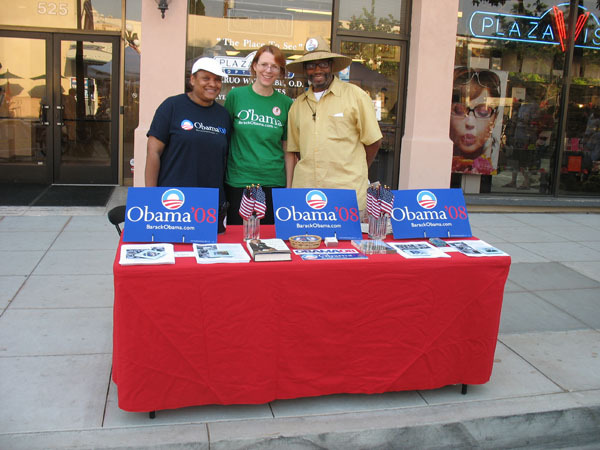 Walker and company also hit the Covina fair on Friday nights. Monrovia as next to the petting zoo. say the tabling has worked magic. had Republican stopping by and saying they liked Obama, Boone said. need to do this as Americans. are not taken in by the Clinton machine. team: He is the team nobody really wants to face. jumping off the hook from supporters calling in to celebrate. Everybody loves a winner, he said. high gear, said team member Lance Mungia, a filmmaker from Monrovia.